International removals to Spain: the options can vary depending on your removals service provider, your budget and so on. It is wise to do plenty of research before choosing the company you are going to entrust your belongings to. One thing it is worth discovering is whether they are movers that also offer packing services. There are many advantages to choosing a company that can offer a full packing service as well as removals to Spain. The first is that you know your goods will be packed professionally. The removers themselves will know exactly how much packing material to use on each piece of furniture and precious possession, meaning that everything will arrive in Spain safely. However, in the unfortunate event that some of the pieces are broken in transit, it may be possible to claim on your insurance if this was the fault of the removals company. This is another bonus. Furthermore, using a packing service before removals to Spain from UK means that you won�t end up paying more for packaging materials than you might do if you estimate it yourself. This will, of course, save you money. A removals company will only charge you for what is actually used. Time is another major factor is choosing to have your belongings professionally packed. Professional removers can do the job in a day or less. It could take you a number of weeks to get everything packed away, due to having to continue with your day job or generally being busy with everything else that needs to be done at this hectic time. 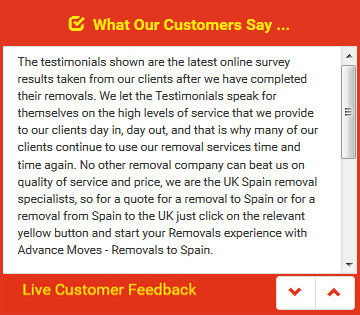 Are you looking for the best when it comes to international removals to Spain? Do you want a company with years of experience and exceptional customer service? Then you need Advance Moves (http://www.advancemoves.com/). Please see our website and get in touch on 0871 218 0612 or email info@advancemoves.com for more information.